The apartment was recently renovated to a high standard to offer stylish contemporary accommodation perfect for a relaxing holiday. 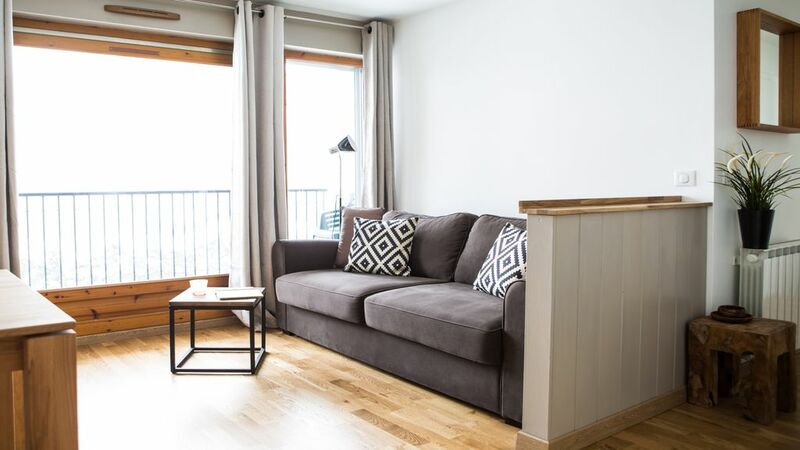 Fermes du Montenvers B11 is situated in a peaceful residential area only 5 minutes walk from Chamonix centre, the Aiguille du Midi and Montenvers train station. The Mulet bus stop is also just around the corner (by the bins) and will ferry you to the main bus terminus from where you can catch services to all the ski resorts. The main living space in this apartment is open plan and has been decorated with light neutral tones to create a bright and airy space. Large floor to ceiling sliding glass door lead out onto a sunny balcony where you can enjoy the beautiful surrounding mountain views – perhaps with a well-deserved cup or tea or glass of wine. Inside there is a comfortable sofa where you can stretch out and relax in the evenings, a dining table seating six and a fully equipped kitchen with everything you need to self cater, including a dishwasher so you don’t have to waste any of your precious holiday time slaving over a sink! To keep you entertained throughout your holiday, the apartment includes WiFi access so you can keep up with the world online and Satellite TV and DVD player so you can switch off in front of a film. For your convenience the apartment includes a washing machine, tumble dryer and garage parking where you can also store your skis and bikes. Mountain Base are a rentals company who offer a carefully selected portfolio of self-catering chalets and apartments in the Chamonix Valley. Operating since 2004, we are one of the few British run businesses in Chamonix to hold the Carte Professionnelle which obliges us to maintain a Garantie Financière (cash bond) to ensure all our clients are financially protected. Our philosophy is simply excellent professionalism and service. From a speedy response to any questions through to a dedicated in-resort service, our team are at your disposal. Our office is in central Chamonix, so we are on hand to advise you throughout your stay and organise any little extras that you need. Mountain Base's services include everything from pre-ordering lift passes through to arrangements for catering, equipment hire, ski lessons and activities such as husky sledging and paragliding. Modern and extremely comfortable, this apartment is within easy walking distance of the town centre, supermarkets and major tourist attractions. You’ll also find underground parking (a rarity in Chamonix). However, if you don’t have a car, the Mulet bus stop is just around the corner (by the bins) and this service takes you around town and to the main bus station. Bicycles and Mountain bikes can be hired at most of the sports shops in Chamonix. Many of the lifts adapt in the summer to carry mountain bikes. Chamonix valley has 5 Ski stations. There are many equipment rental shops in the town. There is a tennis club in Chamonix which is open to tourists. It is situated near the sports centre and lake. Chamonix has an 18 hole course which can be booked from 24 hours in advance. Green fees vary from low to high season. Other reachable courses include Evian (European Masters), Esery and Bossey. Mountain Base offers a fantastic pre-arrival service and are able to make various arrangements for you to ensure your holiday is a success. We can organise everything from lift passes to catering to equipment hire as well as various activities such as husky dog sledging and paragliding. For those of you that are travelling with children we can provide cots and highchairs at an additional cost and recommend childcare providers. We had a great time staying at this property. Very close to downtown area, train station, and bus stations. Would definitely stay here again. Transport in Chamonix:- Although a car provides additional flexibility, Chamonix has a regular bus service that runs the length of the valley. Guests with either a “carte d’hote” or a ski pass can use the valley’s buses for free. By Car:- Chamonix is directly accessible from the A40 in France, via the Mont-Blanc Tunnel from Italy or the Col des Montets from Switzerland. NB. Sat Nav does not list all roads in Chamonix. You can use a credit card at all toll stations. By Train:- There is a SNCF railway station in Chamonix. The TGV high-speed mainline train will take you as far as St Gervais-le Fayet railway station, just 20km away. You’ll then nees to change for the SNCF line which serves all villages from St Gervais-le Fayet to Martigny (Switzerland). Airport Transfers / Buses:- There are a wide number of companies providing private and shared Airport Transfer between Geneva and Chamonix. There are also various coach services such as SAT and OUI BUS who provide daily connections with Geneva, Lyon and Italy. WHAT'S INCLUDED Exclusive use of the property and its facilities Welcome on arrival and in-resort presence for assistance Bed linen as per selected beds 1 bath towels per person 2 hand towels, 2 bath mats, 2 tea towels Cleaning products, bin bags, washing up liquid & sponge, dishwasher tablets, Salt & Pepper, 2 toilet rolls, 2 hand soaps 2 Hair dryers WiFi Parking End of stay cleaning Carte d’hote (bus & train pass) per person ADDITIONAL SERVICES WE CAN HELP ORGANISE ON YOUR BEHALF: Airport transfers & in-resort taxi/shuttle service Welcome food packs Delivery of bread & breakfast pastries and pre-prepared meals Childcare and cot & high-chair rentals Additional cleaning and linen services Spas and pampering Lift passes, delivered to the property on arrival Equipment hire including skis, snowboards and mountain bikes Ski and snowboard lessons Mountain guides Winter activities: cross country skiing, helicopter tours, heli skiing, husky rides, ice climbing, paragliding, mountain safety courses etc Summer activities: canoeing, canyoning, hiking, golf, horse riding, Mont Blanc, mountain biking, mountaineering, rock climbing, paragliding, trail running, white water rafting etc NB: Check-in is from 16:00 - 19:30. For arrivals after 19:30 a late fee of €20 applies and €50 after 23:00. Check-out is by 10:00 on the day of departure.